Every style-conscious Parisian needs a wardrobe change every now and then, and the Citroen DS3 is no exception (minus the Citroen bit, of course – DS is marketed as a separate, standalone brand these days). Officially revealed today, this is the heavily revised 2016 DS3, with a host of changes applied to both the DS3 hatchback and rollback-roof DS3 Cabrio models. Most notably, a new face, with a square-cut grille and more angular bumper treatment that makes the DS3 look a bit like a disgruntled Transformer. A shiny chrome surround for the grille makes sure there’s no missing the new design, with a ‘double wings’ motif, reaching out to the headlights and fogs. Elsewhere, 3D-effect tail-lights and a few other minor tweaks aside, its business as usual, with the DS3’s trademark ‘floating’ roof, two-tone paintjobs and sharkfin flicks behind the doors still present and correct. There’s now a dizzying 78 different roof/body colour combos available, including four different hues for the Cabrio’s fabric roof. That figure pales into insignificance compared with the personalisation options, now claimed to total a mildly incomprehensible three million once all the various dashboard and interior fabric choices have been taken into account. Plus a new set of roof decals, including some kind of Argyle sweater pattern. There’s a fresh collection of alloy wheels, too. What about the 2016 DS3’s interior? There’s greater smartphone connectivity, no doubt music to the ears of the DS3’s youthful, urban-based target market. A new 7in touchscreen in the dash slashes the interior button count by 20, and incorporates MirrorLink for Android phones and Apple CarPlay for iPhones, mapping the handset’s functions and apps directly to the dash display. The voice control system’s learnt a few new tricks too, including hands-free text messaging and Siri commands for Apple phones on the move. There’s also a downloadable ‘MyDS’ smartphone app, telling you when you’re next service is due, what your fuel economy’s been and even where you’ve parked. Seven engines are available in the UK: three ‘PureTech’ 3-cyl petrols, two THP 4-cyl petrols and two diesels under the ‘BlueHDi’ banner. Of those, the 128bhp PureTech 130 three-pot is new to the range, and PSA’s latest EAT-6 automatic gearbox can be had with the lower-powered PureTech 110 engine. Go for the 99bhp diesel and you’ll enjoy a tax-dodging 87g/km CO2 rating, although the 2016 DS3 range as a whole doesn’t top 129g/km. Anything sporty in the offing? A new variant called the DS3 Performance will join the range in April, with a 205bhp, 221lb ft 1.6-litre ‘THP’ petrol engine, a six-speed manual gearbox with shorter ratios, and a Torsen limited-slip diff. The Performance version also gets 15mm lower suspension, wider track front and rear within wider wheelarches, and bigger brake discs with different calipers – plus twin tailpipes and chunkier sills, to make the point visually. DS personnel are quick to point out that the 3 Performance is no sports car though, rather a top-of-the-range hatchback which majors on luxury, kit and refinement as much as driving fun – think of it as a GT rather than a GTI and you’ll be on the right lines. ‘Performance for us means more than just high power, it also means performance in comfort and quality. The DS Performance division could also grow over the next few years and include a performance model for the 4 and 5 model ranges,’ says Eric Apode, vice president for product and development. Anything else I should know about the new(ish) DS3 and DS3 Cabrio? You’ll be able to buy the DS 3 in five trims, including the above Performance model. Entry-level cars will see an approximate £700 price hike. Still starting from under £14,000, you’ll get additional kit for the money with all cars coming equipped with Bluetooth, air-con and the 7in touchscreen system. Elsewhere on the expanded kit list are front and rear parking sensors, a reversing camera with guiding graphics and Hill Start Assist in manual models. Oh, and you can still retract the Cabrio’s roof at up to 70mph on the motorway if you want. Rear visibility remains pretty lousy. What does the future hold for DS? Six new models are planned to join the range from 2018, including two SUVs, a large saloon and an electric car. Although the firm has done much over the past year to separate itself from Citroen, from a servicing and maintenance point of view it’s very much business as usual with buyers able to use all dealerships for both brands. 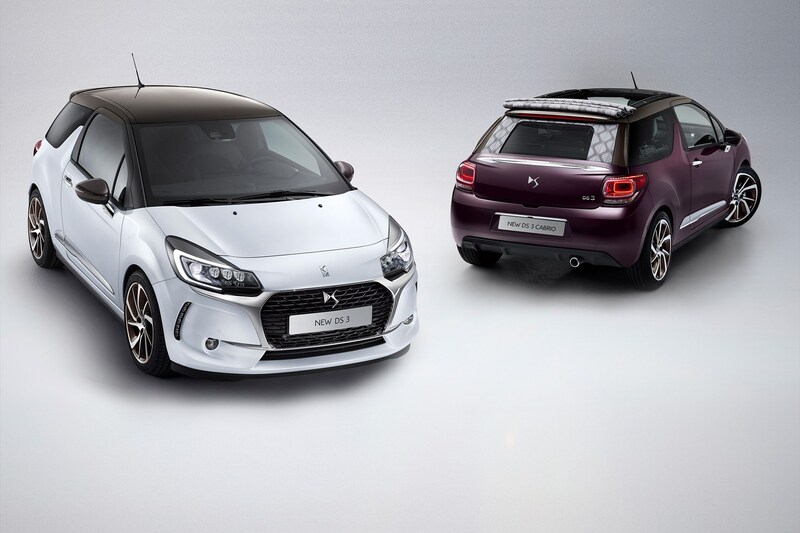 Read CAR’s reviews of the original DS3 hatchback here, and DS3 Cabrio here.